One area in which my prior ports of call -- Vancouver, Montreal -- cut NYC is in the quality and quantity of free summertime outdoor jazz shows. Neither of the big NYC jazz fests (JVC and Vision) have much to offer in this area -- Vision has nothing, JVC co-sponsors a single performance in Prospect Park. This year Celebrate Brooklyn included a second jazz hit in addition to the JVC show. 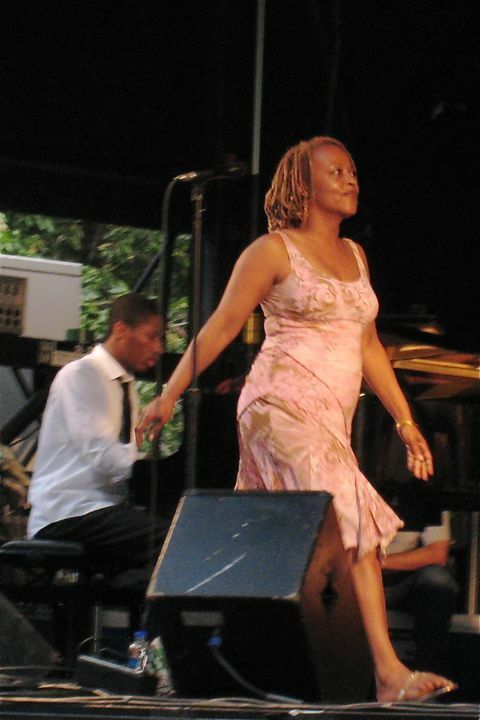 There was also a token jazz hit at Central Park Summerstage (Cassandra Wilson), one at River to River (Marc Ribot), and a smattering of smaller shows here and there. 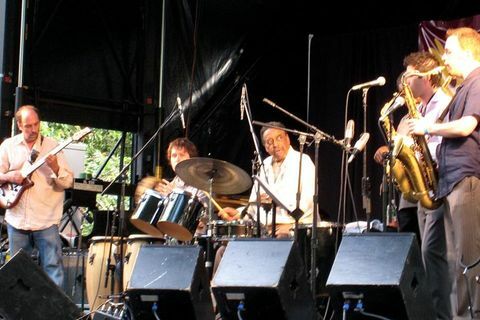 But there's nothing remotely on the scale of Vancouver or Montreal during jazz fest time, with multiple outdoor stages jam-packed with gigs over the course of several weeks. They are far from perfect -- the live sound is often a problem (especially in Montreal), and the quality is highly variable. But the sheer quantity of shows means that programmers are free to take some chances with the scheduling, so there's always at least a few gigs that are both (A) free, and (B) worth seeing. 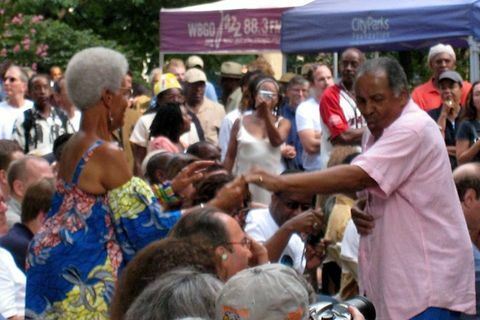 What NYC has is the Charlie Parker Jazz Festival, now in its 15th year. 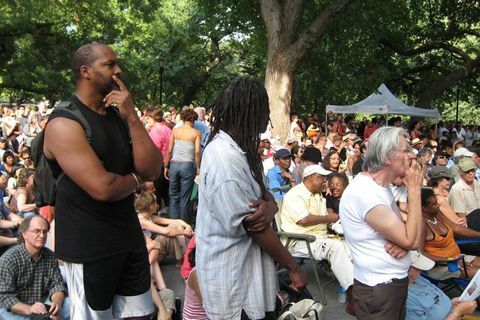 But the "festival" is just a couple of days in late August -- Saturday in Harlem's Marcus Garvey Park, and Sunday the East Village's Tompkins Square Park. The headliners play on both days, which cuts down on the variety of the programming even further. And the sound, at least at Sunday at Tompkins Square, was notably atrocious. 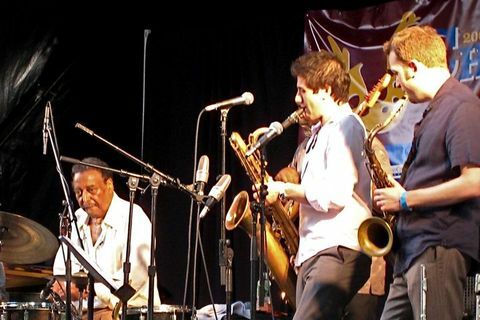 On the other hand, one of the headliners was Chico Hamilton, who is just a few weeks away from his 86th birthday. So there's that. The classic Gerry Mulligan-Chet Baker-Bob Whitlock-Chico Hamilton quartet is one of my all-time favorite small groups. Obviously, Gerry's writing and arranging are top-notch, and the lack of any chordal instrument was a bold choice at the time, but what I really love is how the group manages to pull off this incredibly casual, laid-back, distinctively West Coast vibe while still swinging incredibly hard -- they come across like a irredeemable stoner who somehow never lets the pot blunt his conversational wits. Chico deserves an immense amount of credit for this. His drumming is ultra-minimal -- never showy or bombastic, but everything is in its right place, and played with impeccable finesse. 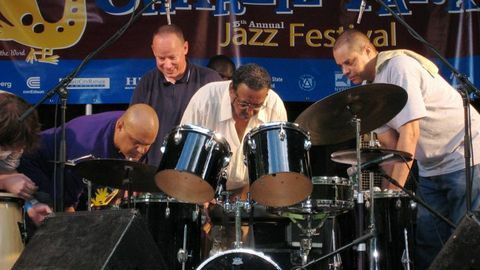 It's a very old-school, practically pre-bop approach to drumming, where the timekeeping is the focus, and whenever he breaks the pattern for a punctuation, a fill, or a bit of comping, it really means something. And his relationship to the time is deep and personal in a way that has all but vanished, while remaining apparently effortless. Hearing him live for the first time was a revelation -- it's not just that his playing seems undiminished by age, it's like he's actually taking you back in time to show you how it's really done. 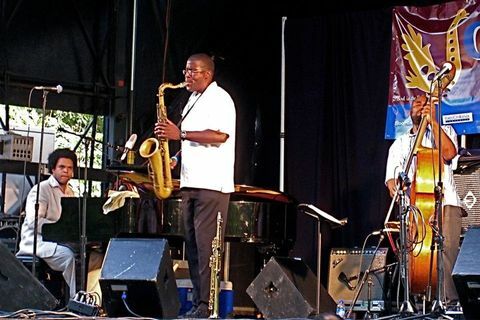 Not that Chico's an arch-traditionalist -- the sextet he brought to the parks this weekend includes Paul Ramsey on fretless electric bass, and Cary DeNigris on electric guitar. 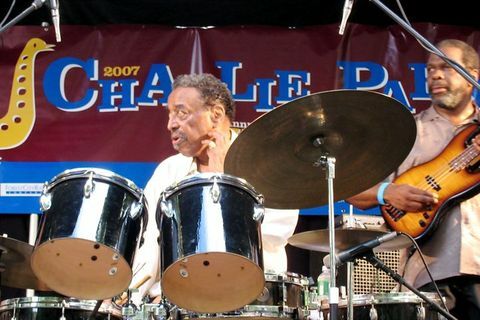 Like Max Roach, Chico is an inventive composer -- in fact, he honored his late friend with an apparently brand new mallets-driven original called "Just Play The Melody." But Chico's always been interested in moving the music forward -- one of his first projects as a leader was a quintet with a then-unprecedented instrumentation of flute, cello, guitar, bass, and drums. This was in 1955, mind you. Oh, and that guitar player? 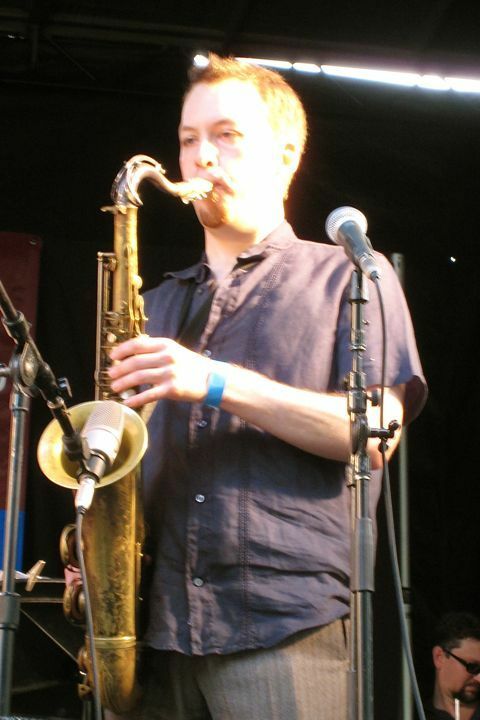 Jim Hall. A later incarnation of this group appeared (as themselves) in The Sweet Smell of Success -- one of the hippest onscreen jazz moments. Chico has a great ear for talent -- in addition to Jim Hall, he also discovered Eric Dolphy, Charles Lloyd, Larry Coryell, and Thomas Chapin. He's also written a few film scores, including one for Polanki's Repulsion. 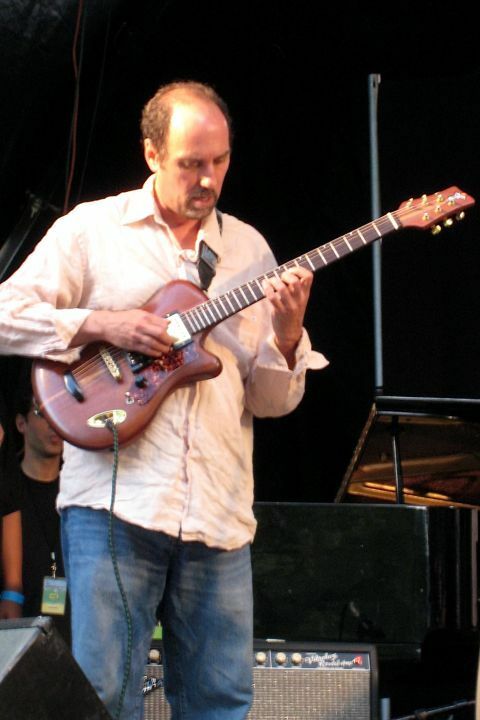 The current sextet has great musicians and lots of evocative, cinematic tunes, contributed by leader and sidemen both -- check out the recent selections on Chico's MySpace page, especially the languid "Christina," which sounds like it's just begging for Calexico to cover it. 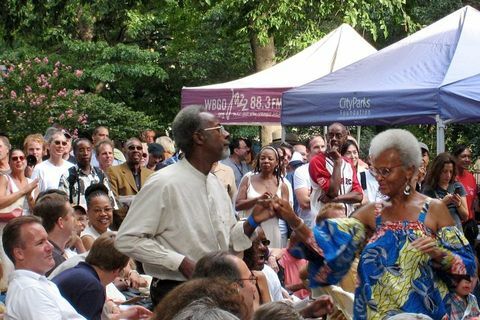 And he plays with such irrepressible joy and such timeless elegance -- during an infectious shuffle called "Thunderwalk," a few young-at-heart old-timers got up to strut their stuff (see pics below). And, as Ben Ratliff pointed out in his review, this seemed to delight him to no end -- as he told the crowd afterwards: "People dancing! That's the best compliment you can get." Yeah, that's right -- 1958. 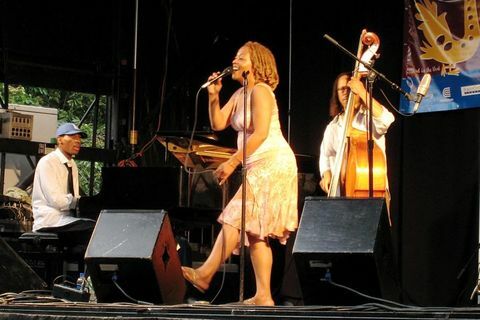 Cassandra Wilson followed, a last-minute sub for an ailing Abbey Lincoln, using most of Abbey's rhythm section -- Jonathan Batiste on piano and Michael Bowie on bass, with the young phenom Marcus Gilmore on drums and Evan Schwam on tenor (borrowed from Chico's band). We were told Lincoln's no-show was due to the heat, though it wasn't actually that hot on Sunday. This week must have been unbelievably difficult for her, so here's hoping it's nothing serious. 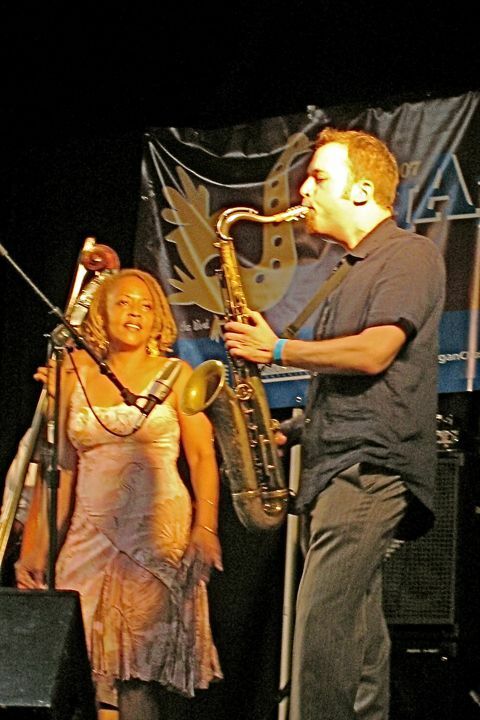 I have to admit I haven't really followed Cassandra's post-Blue Light Till Dawn career, although I really admire her early work with Steve Coleman. 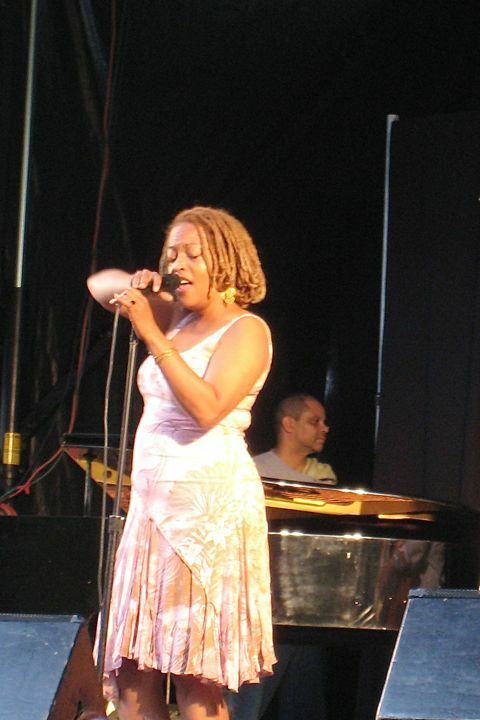 But here she played the straight-up jazz diva, with loose renditions of well-worn tunes like "Caravan," "Blue Monk," and "Up Jumped Spring." She had trouble negotiating the bop blues "Now's The Time" and only really seemed to cut loose on a scorching "St. James Infirmary." The band had their moments, especially Batiste, but the horrendous live sound was particularly harsh on Michael Bowie's bass, and he never seemed to quite lock in with Gilmore. It felt like a jam session, which it basically was -- enjoyable enough, under the circumstances, but all these musicians are clearly capable of better things. I missed Maurice Brown's opening set, but got there just in time to catch former Wynton Marsalis associate Todd Williams's quartet. I really honestly hate to go negative on this blog, but in this case I'm left with little choice -- their set was almost uniformly leaden, plodding, and ponderous. Pianist Eric Lewis had a few crowd-pleasing solos that left me totally cold -- he just seemed to move randomly from one flashy gimmick to another without any attempt to tell a coherent or convincing story. The leader's playing was flat and uninspired, as were his tunes. I found myself wishing the festival organizers had given this high-profile opportunity to a genuinely creative up-and-comer. It's not like they lack for choices. Maybe if they had more than a single weekend to work with, there would be more opportunity for creative programming and audience-building. My dad has a handful of ancient Chico Hamilton records in his collection, so I grew up on that stuff. Some other alumni who I think are notable: Arthur Blythe, Gabor Szabo, John Pisano, Buddy Collette, Paul Horn. Indeed -- I forgot about Arthur Blythe, but you're right, he played with Chico's bands in the 1970's. And that's John Pisano on guitar in that Newport clip I posted -- that is really an unusual and brilliant guitar solo. Thanks for the review and the amazing clip of Hamilton from 1958. I don't know if you read any of the comments below the clip on youtube, where a few people point out Pisano's solo makes use of an Etude by Villa-Lobos (I think no. 1) for a good part of it. This is an ingenious, inspired use of this piece. I didn't know anything about Pisano so once again, thanks for sharing. ...and I forgot, Eric Person is another one. How 'bout that -- the Chopinesque chord progression is definitely borrowed from Villa-Lobos, but the strumming and the jangly electric sound give it more of a rock vibe -- makes me wonder if Johnny Greenwood has ever seen this clip. Wow! 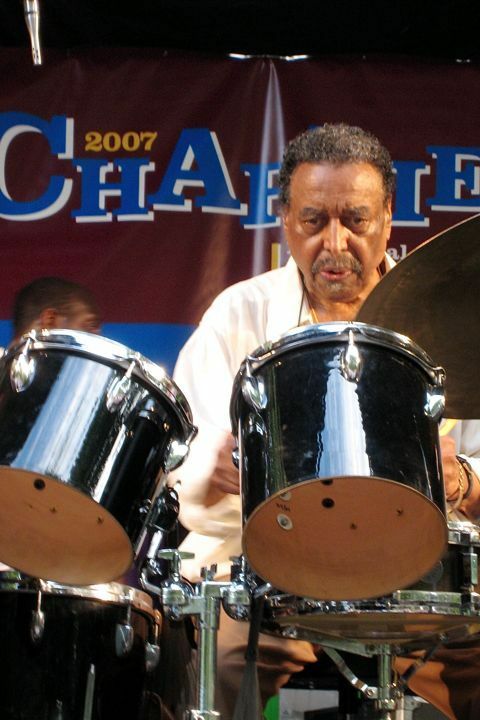 Thanks for that clip of Dolphy with Chico Hamilton, incredible. I'll always love Chico for turning me onto Gabor Szabo, whose singular guitar style I have adored ever since.